Built in 1734, the Ashley House served as the home of Deerfield’s 18th-century minister with furnishings of the Connecticut River elite and English ceramics. It is an example of Deerfield’s first 18th-century building boom. In the 1730s, successful Deerfield farmers enlarged old dwellings and built new ones often with stylish doorways in a distinctive Connecticut Valley style. In the 1750s, the Reverend Jonathan Ashley made substantial alterations to his house, such as a grand doorway, a central hallway staircase, and fine paneling. Inside the house visitors see furnishings owned by the Connecticut Valley’s “River Gods,” the political-military-mercantile-ministerial elite that governed the towns of western Massachusetts until the American Revolution. 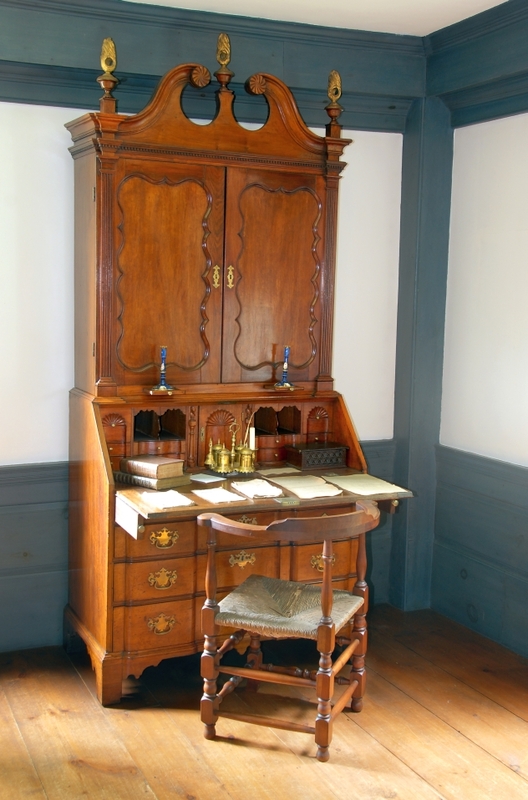 Ashley bought cherry and mahogany furniture for his parlors and chambers, imported English and Chinese ceramics for tea and punch, prints that demonstrated his English allegiance, and textiles that gave comfort and color to domestic life. The Ashley House was the first restoration opened to the public by the founders of Historic Deerfield, Henry and Helen Geier Flynt, in 1948. Guided tours of the Ashley House are available on the hour during the regular season from 10:00 am to 4:00 pm. Please check at the Hall Tavern Visitor Center desk for more information about tour times.